is available to all of our existing clients. This document is produced periodically to advise of new products and to give additional information on our roadmap for new product planning. 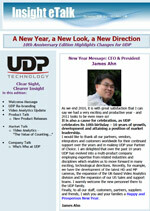 If you are an existing client of UDP and you would like to be added to the newsletter please fill in form below and submit. If you are not an existing client of UDP but would like to know about trade shows we attend and new product news please also complete the following form and we will keep you informed of our marketing activities. UDP Technology Ltd., a leading provider of digital video solutions for the security and IP surveillance industries, has announced a re-organization and expansion of its UK-based Video Analytics division, VCA Technology Limited. The move will see the full integration of the VCA Technology development team and the UDP development team and a change of video analytics company’s name from VCA Technology to UDP Analytics Ltd. In an announcement today from the company’s Seoul, Korea, headquarters, UDP CEO and President, James Ahn, stated that a new international analytics team will be formed from the staff members in the UK and new, additional team members based at UDP HQ. The VCA branding will be retained. This expansion in the analytics development team confirms UDP’s belief that analytics will become a key feature of all CCTV products and systems. Regardless of this change customers will continue to enjoy UDP’s worldwide technical support which will be extended to cover VCA support.